White, ivory, cream… it doesn't matter which color you choose. Having a light colored blazer in your closet is a game changer and a regular addition to the capsule wardrobes I create on Wardrobe Oxygen. Unlike grey which reads corporate, navy which can be hard to match, and black which can often be too severe and hard to match, ivory is a winner. It works as an accent, not needing to match with any other neutrals in the capsule. It can dress up and dress down as easily as black, and will make black closet basics look chic and cohesive. Ivory works year round, and it's often more flattering than black and dark neutrals. 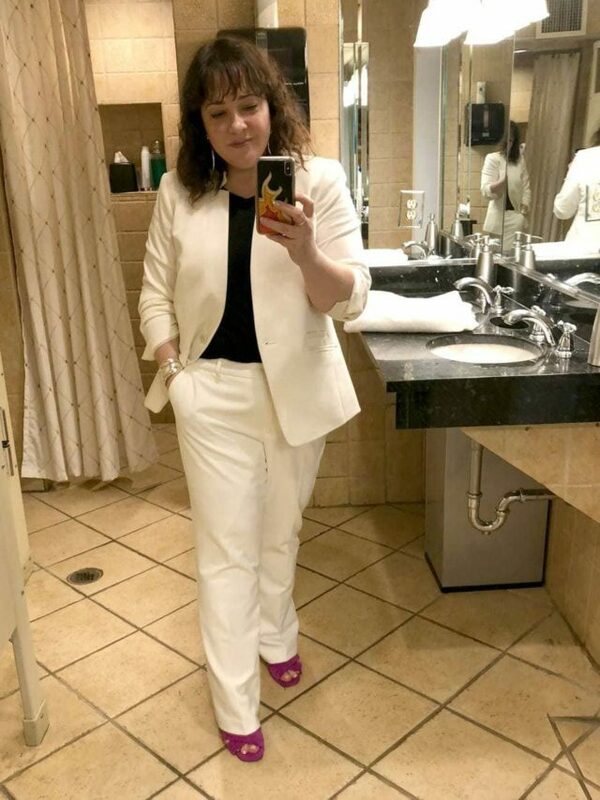 I incorporated this ivory blazer from Talbots in my real-life capsule wardrobe and in this post I show its true versatility. When I was invited to visit Good Housekeeping, I was taking a train and immediately hailing a cab to Hearst Tower. I was also asked to wear a pair of shoes from the host company. What would survive four hours on the train and still look fresh and stylish? What could look cool and polished with a pair of sneakers? My ivory blazer! I styled it with a striped top from J. Crew and the same jeans featured in the real life capsule wardrobe. It was a smart choice; the look held up from morning until night, photographed well, and was equal formality to the other event attendees. A relative was celebrating a milestone birthday at a country club. It was May, but the day was unseasonably cold and rainy. For such an event I'd normally wear a floral maxi dress, but with the weather I wanted to be warm, yet still a bit dressy (but not too dressy). Again I chose my ivory blazer, this time with the matching trousers, as black t-shirt, and a pair of colorful shoes to keep it from looking too corporate. For the real-life capsule wardrobe, I styled it three more ways to show its versatility. I'm all about using accessories to change the silhouette of a garment. Scarves, long necklaces, and belts can really add life and outfits to your existing wardrobe. Just by belting the blazer, the waist is highlighted, there's an added print and texture, and a bit of a peplum effect is fun and a bit more youthful. This would be a fun look for brunch, or for Casual Friday at the office. Depending on your personal style and figure, a variety of belts and even scarves could work for this look. Try a wide elastic belt, an oversized scarf tied like a cummerbund, or even an obi-style wrap belt. You don't need a matched set to look professional at the office. An ivory blazer can make separates suddenly cohesive. While this look is a bit more casual with a white tank, you could easily switch it out for a silky shell or blouse in black, white, or any color under the rainbow. 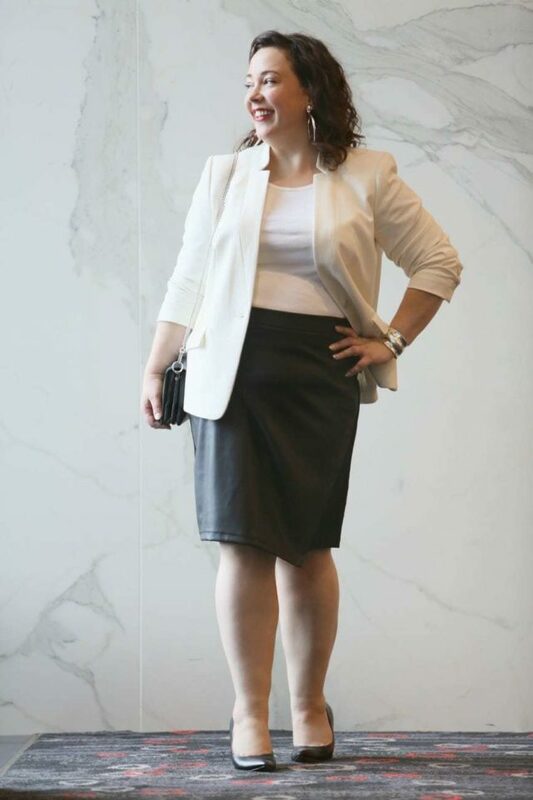 While this look can be office-friendly, the ivory can also make the look more evening, and this is an outfit that can easily go from desk to drinks. The addition of statement accessories and a small handbag are what make it look dressy. 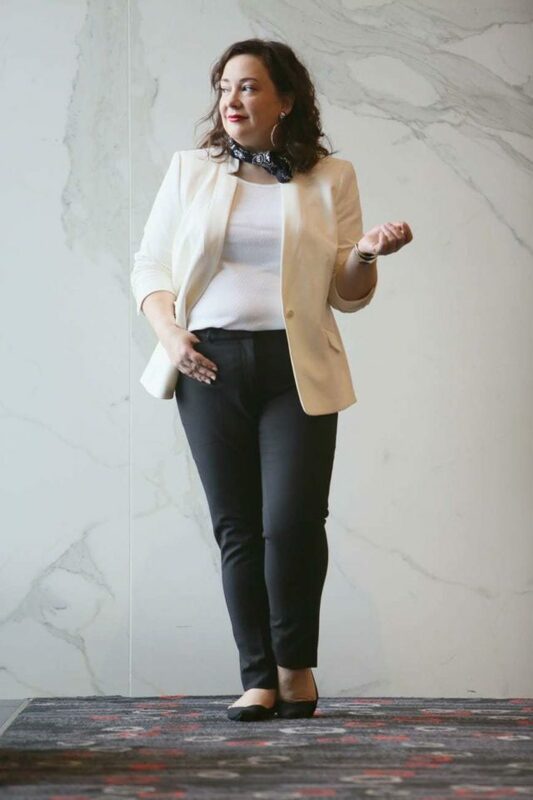 Especially if you get your blazer tailored to fit your figure (everyone needs to do this, no one is shaped like a garment right off the rack), it will look equally great with pants and skirts. While black pants and a black blazer can look a bit too formal, black pants with an ivory blazer looks fresh. Yes, you can mix ivory and cream with white; combining neutrals very close in color can give a luxe look and make cheaper garments appear more expensive (look what it did here for a ribbed tank top, imagine how elevated it would be with a white silk-like blouse). Add a scarf instead of a necklace; by having it black it pulls the whole look together. With such an elegant palette, you can get away with a pair of comfy flat shoes yet still look professional. 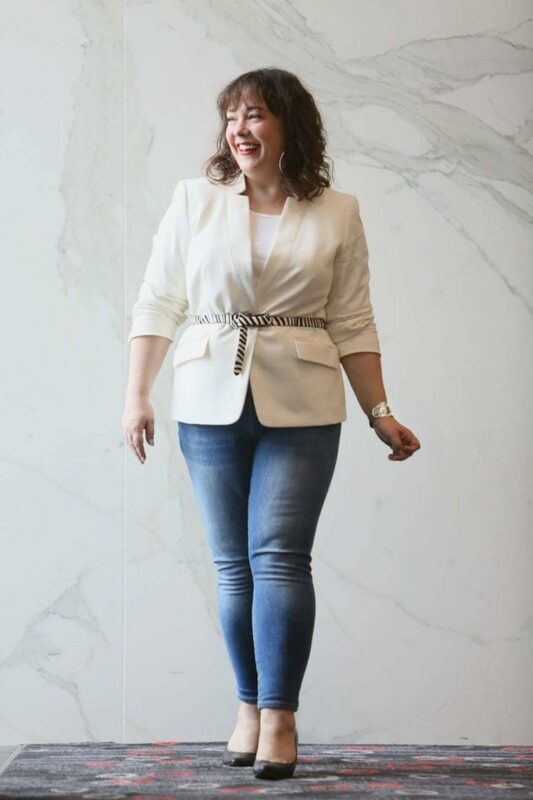 When it comes to purchasing an ivory blazer, I recommend buying the best you can afford, if in doubt size up, and take it to a tailor to get it custom fit (this blazer is currently at the tailor as my figure has changed since I originally got it). If well made and well fitting, this is a piece that you can stylishly wear for years to come. The blazer was a gift from Talbots, the tank and skirt a gift from Universal Standard, and the pants a gift from White House Black Market. However, each item is in this post and featured in the capsule wardrobe because I truly love them and wear them often. I have short arms and a regular sized body so my tailoring thing is to get the sleeves fixed. If something doesn’t have a lining I can do it at home, but linings are complicated so I got to an alterations place. I think it makes a difference not to have rolled up sleeves. I will say that I think twice about a purchase that will involve tailoring b/c it adds expense, but makes the item more wearable. Same. I don’t buy willy nilly thinking a tailor can fix it. But when it’s something like this suit, it’s such good quality, the style is spot on for me, that it’s a worthy investment. Agree it’s worth it to not have to roll sleeves. I did that for so many years and I love the polished look of an uncuffed sleeve hitting at the right point! Interesting piece. I must say I have never thought of tailoring – maybe in the UK it is not as simple, but also I suspect I am just lazy. But I am curious – what happens if a jacket is lined? Realistically I suspect that your post will never inspire me to have anything altered, but what it has done is made me put on a white tee shirt for the first time in years. I have several but stopped wearing them. Why? I think partly because I feel that you can see a slightly bulgy tummy outlined, and partly because a photographer once told me, when I was complaining that a photo showed too much double chin, that the light reflected up from a light top to emphasise it. But I am wearing a white tshirt now, with some vaguely coral-coloured jewellery, and feeling rather fab. I take my blazers to a tailor, I don’t try it myself but he is able to adjust the lining along with the exterior. He’s shortened sleeved that have buttons, has made boxy blazers a bit more fitted, and more. It’s not cheap, but it’s cheaper than a new jacket and if it fits beautifully it makes the jacket look all the more expensive and polished. And I LOVE you’re wearing a white t-shirt! And boo on that photographer, it’s not what you’re wearing, it’s his lighting and the angle he shot you at/pose he had you hold. Wear what you want (and I love the combo of white with coral it’s so fresh!)! LOL you won’t regret it! Loving this. Thank you for this great series. Totally copying!! I saw this blazer in the Talbots catalog, but then I think they are too preppy for me. You’ve proved me wrong. How do you find the fit of this blazer? Thank you! Yay! I am a Talbots fan even though I am not their typical style. I think their clothing is pretty true to size, their petites are true petites and sometimes too short for me. However, this jacket I think is meant to be a bit more of a classic fit and it’s a hair big on me now. Whatever size I wear in Halogen, Ann Taylor, or Banana Republic I usually also wear in Talbots.